Funny, it doesn't look like a Crosstrek. 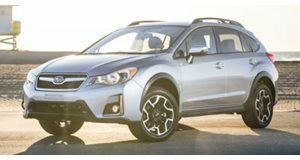 You typically don’t think of the Subaru Crosstrek as anything remotely close to being badass. That’s fair enough, but then there’s this: the Baja 500 desert racer Crosstrek. Subaru teamed up with Grabowski Brothers Racing and Crawford Performance to compete this heavily modified (and barely recognizable) Crosstrek in one of the more grueling off-road racing events, which took place in Ensenada, BC Mexico this past Saturday. The Grabowski Brothers, Dusty and Parker, are piloting the Crosstrek, which was built by Quirt Crawford for the Class 5 event. It’s powered by – what else – a Boxer engine. Prior to the Baja 500, the team conducted a test run by entering the McKenzie’s 250 race in Lucerne, California. They won their class by over one hour. The Grabowski brothers, aged just 20 and 24, have won multiple championships in short course racing but this is their first Baja 500. For the record, the Baja 500 is a 516 mile loop race that starts and finishes in Ensenada, Baja Mexico.